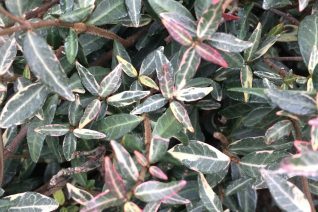 Cool little Asian Star Jasmine with tiny variegated leaves that forms dense mounds as a ground cover or in time it can reach up as a cute and not strangling vine. Each leaf is margined and splashed with white. New growth has distinct pink tints for a distinct multicolor effect. Forms a fine textured plant but as a small scale ground cover it will block weeds. To 1′ tall x 30″ wide as a ground cover. To 8′ tall or higher as a self clinging vine in wind free places. Rich, well drained soil with regular summer water. Definitely double dig the soil before planting to incorporate oxygen as well as assist in absorption of water. Add organic fertilizer as well. Trachelospermums appreciate good drainage and regular summer irrigation to do their best. Otherwise drought tolerant but slow growing. Nice on fences or screens or up the trunk of a Trachycarpus (Windmill Palm). Good deer resistance. Evergreen. This poor plant though spectacular has a bunch of silly marketing names attached to it. We stick with the original Japanese cultivar name- seems appropriate. 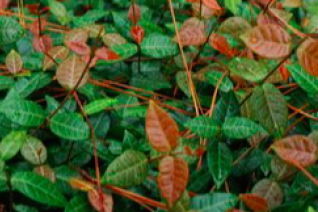 No other evergreen vine/groundcover has a foliage display that matches this plant. New leaves emerge bright orange and then morph slowly to patches of light yellow surrounded by dark green. Delightful. We’ve never seen flowers on this cultivar and we don’t need to. Great small scale and vivid ground cover. Mounds and trails to 8″ tall and several feet wide in a single season. It has been surprisingly hardy to cold enduring temps below 10ºF with no harm. Best in part shade to shade in rich, well drained soil with regular summer water. This vine grows when its warm therefore you water it when its warm. Twins around thin objects and will eventually hoist itself skyward. Solidly evergreen. Excellent container plant. Moderate deer resistance. We’ve grown this excellent small scale groundcover for 20 years and it never fails to find a useful place in gardens. ‘Red Top’ Asian Star Jasmine is named for its bright red new growth which settles down to green with white veins. Each leaf is very pretty but as the plant mounds up and becomes dense its downright elegant. Thick growing ground cover for full sun to full shade in rich, moisture retentive soil. Takes very dry conditions once it has rooted in a bit. Trailing stems will root as they touch the soil providing erosion control. In wind free places with support it will actually climb as a vine and become self adhering to any rough surface. We’ve never seen it bloom and it doesn’t have to . Moderate deer resistance. To 10″ tall and 3′ wide as a ground cover. Regular water significantly speeds growth. Good winter appearance. Easy to grow plant. 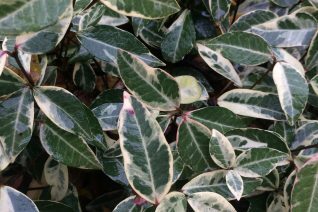 Variegated Asian Star Jasmine. Excellent evergreen ground cover with playful foliage that looks great year round. Lovely entire leaves are spaced and outlined in cream. Great contrast to the sage green leaf interior. 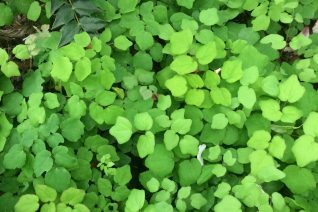 Trailing ground cover (occasionally it can rise up to be a vine- in windfree locations with support) but mainly its value is a year round showy and consistent look. Mounding and trailing it will root into the ground when it feels like it. To 10″ tall and 3′ wide as a ground cover. Full sun to dense shade in rich, well drained soil. But it adapts to harsher sites if given regular water. Excellent under trees, shrubs. Dense enough to discourage weeds. Very cold and drought tolerant. Seldom blooms. Moderate deer resistance. Siskiyou Inside-out-Flower is a much more drought tolerant version of our locally native Vancouveria hexandra. This yellow flowered form tolerates extreme dry shade and colonizes even compacted dry soils to create a handsome ground cover. 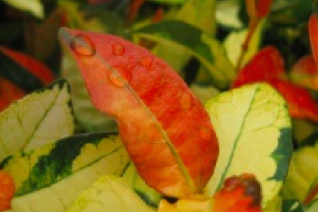 The delicate looking interestingly shaped leaves create a soft mound of leaves, belying its tough disposition. Mostly evergreen if temperatures stay above about 15ºF. In late spring wiry winding tall stems support small nodding yellow flowers. Basically this is our version of Epimedium but with more tolerance for summer drought. To 8″ tall and spreading to several feet wide in richer, moisture retentive soil. Light summer water increases growth. Part shade to full shade. Oregon native plant. 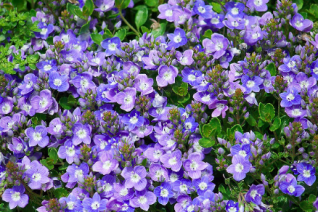 Turkish speedwell is an excellent low water creeping ground cover that performs wonderfully in our climate. Flush with the ground this evergreen creeps in well drained average to enriched soil to several feet wide in several seasons. In April to May carpets of sky blue flowers obscure the entire plant. Very pretty. Roots as it grows, excellent for erosion control on a small scale on steep slopes. Regular summer water speeds growth but once established it takes summer drought very well. Full sun to the very lightest shade. Dies out in compacted soils- make sure to double dig the area around where it is to go to incorporate oxygen in the soil. For tired plantings simple overspread compost on top of it and let it settle between the leaves in early spring. Easy to grow hardy little ground cover. Moderate deer resistance.